A great little story here. I can see why Matt and Ben bought it. EXCLUSIVE: Fox is poised to win the hot lit property in the marketplace at the moment, a giant Happy Meal that everyone wanted. Ben Affleck is attached to direct and Matt Damon to star in a true-crime story written by Jeff Maysh and published in The Daily Beast several days ago about an ex-cop who rigged the McDonald’s Monopoly game, allegedly stealing over $24 million and sharing it with an unsavory group of co-conspirators who offered kickbacks to the mastermind. The Pearl Street partners will produce with David Klawans, latter of whom got rights to the article and was exec veep on the Affleck-directed Best Picture Oscar winner Argo. Deadpool scribes Paul Wernick & Rhett Reese will write the script. Deal was a $350,000 option against $1 million if the film gets made. Affleck, Damon and the screenwriters get paid a lot more than that. In 1989 McDonald’s ran the biggest flexi-disc promotion ever, sending out 80 million discs (playing the “Menu Song”) as inserts in newspapers all over the country. A very special copy of this record was almost burned to heat a family home in Galax, Virginia. Instead, it ended up winning the homeowner a million dollars. This seems to be a micrososm of the new American story in a post-80’s culture: People scraping by in hopes of a big pay day that will save them all, but in the end it does more to ruin them. McDonald’s used to make the best fast food french fries in the world — until they changed their recipe in 1990. Revisionist History travels to the top food R&D lab in the country to discover what was lost, and why for the past generation we’ve been eating french fries that taste like cardboard. I love the double entendre “broke my heart”! This does make me curious to try making my own beef tallow french fries. Directed by John Lee Hancock. With Michael Keaton, Nick Offerman, John Carroll Lynch, Linda Cardellini. 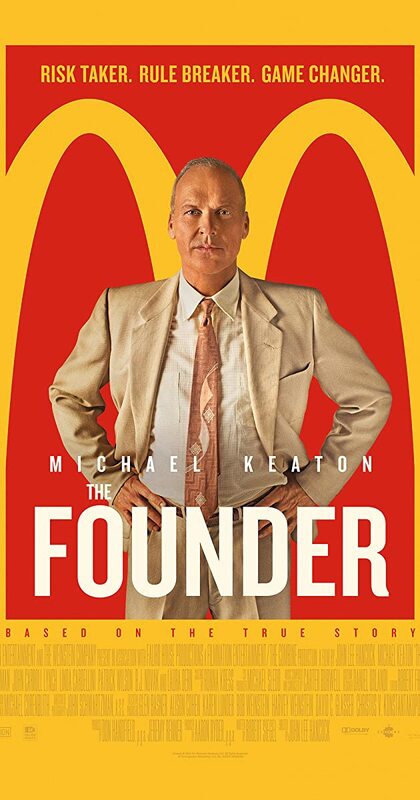 The story of Ray Kroc, a salesman who turned two brothers' innovative fast food eatery, McDonald's, into the biggest restaurant business in the world, with a combination of ambition, persistence, and ruthlessness. Ray Kroc was apparently a far more complex character than I had expected he would or could be. Not that I’ve been a big fan of McDonald’s before, but I have less respect for it as a corporation now, but more respect for its true founders. It’s an interesting quirk of fate that this film premiered on January 20, 2017 and the parallels that Kroc has with the 45th president who was inaugurated that day. You probably don't even notice them, but social norms determine so much of your behavior - how you dress, talk, eat and even what you allow yourself to feel. These norms are so entrenched we never imagine they can shift. But Alix Spiegel and new co-host, Hanna Rosin, examine two grand social experiments that attempt to do just that: teach McDonald's employees in Russia to smile, and workers on an oil rig how to cry. This is a fantastic episode that fits right into the heart of their running theme. The psychology of the smile isn’t something one thinks about often, but it has such a profound effect on our daily lives.